It was a rowdy Saturday night at the Furneaux Lodge, NZ were playing Australia (Rugby) and from nowhere 32 boats arrived and moored in the bay, the bar was packed with people watching the match on a big screen, NZ won and a good time was had by all! Our ride back to Picton was due to leave at 09.30 so we had breakfast and made our way down to the jetty. The ferry arrived and we set off for the one-hour journey to Picton dropping off some walkers and a mountain biker at various point along the Queen Charlotte Track. Once again we were incredibly lucky with the weather, we sat on deck and soaked in the amazing scenery and bright blue sky. Back at Picton we picked up a new hire car and headed for Nelson. We picked the scenic route, Queen Charlottes Drive which ran along the coast and over the hills in to Nelson. Apparently, Nelson is the 2nd most populous town on the South Island, we stopped in to have a look around and find somewhere for lunch, it was pleasant enough and we found a good craft brewery pub for a (very) late lunch but there wasn’t much to keep us there. We got back in the car and headed for our B&B about 30 minutes out of town in Upper Moutere, wine country. We arrived at Kimeret Place and were met by Jo who showed us to a self-contained cottage; we were booked in to a B&B room in the house but we were the only guests booked in that night and she thought we might like the extra space. Having eaten late we decided to take advantage of the DVD library in the cottage and had an evening in. The next town along the coast was a little place called Mapua which had a little passenger ferry across to Rabbit Island, Jo recommended it as a place to visit and we were quite taken with her suggestion that we hire bikes and cycle around the island. Mapua was lovely; just on from the village we discovered Mapua Wharf, a cluster of restaurants, cafés and galleries, before we knew it two hours had passed as we wandered around and spent time in the galleries. One gallery really caught our eye, Forest Fusion, it displayed sculptures by one artist and jewellery made by his wife who was minding the shop. Most of the sculptures were designed to be displayed outside and we could happily have given a home to any (or all) of them. Thank heavens we don’t have any room in our suitcases! There were a series of fish sculptures which were made of old gardening equipment, saw, shears and hoes, they were lovely; and there was a simple sculpture made of three circles of stainless steel blades which were designed to catch the wind and turn in opposing directions. Having resisted the temptation to buy anything we retired to a café for coffee. By this time the weather was starting to close in a bit so we decided against hiring bikes, we had worked out that you can drive onto Rabbit Island at the other end so we thought we would do that instead. We also found out that as it was a bank holiday everything was closing early so we bought a tub of fish pate from the Smoke House on the quay and some crackers from the supermarket to be sure we would have something to eat in the evening. Having seen all there was to see in Mapua we set off for the bridge to Rabbit Island planning to call in at a winery on the way to pick up some wine to have with our fish pate, unfortunately they were all closed. We did get across to Rabbit Island but it turned out to be a commercial timber plantation and not very scenic so we were pleased we hadn’t hired the bikes. Back at the house we sat outside in the garden and ate our picnic; Jo had left us a cheese platter in the fridge and along with the chocolate cake and fresh strawberries she had left out when we arrived but which we hadn’t eaten we had quite a feast. We washed it down with a bottle of local Chardonnay from the cottage fridge, it was from the Rabbit Island winery which we had tried to visit earlier in the day. Tuesday morning, after a wild night of torrential rain, we had breakfast (Jo greeted us each morning in full chefs’ whites and cooked us delicious breakfasts) and set off up the coast towards our next stop, Abel Tasman National Park. The park was only about an hour away so we decided to take the Takaka Hill Highway which skirts west around the park (no cars allowed inside) and on to a town called Collingwood. Collingwood is at the base of the Farewell Spit – the spit of land that curves out from the top of the South Island into the Cook Straight. On the map it looked like the road followed a valley at the foot of the mountains, as it turned out it went up (870m) and over! The road was very good and there was hardly any traffic but as Mark negotiated the steep climbs and hairpin bends we were both aware that there is only one road to Collingwood so we would be coming back over the top again later. As we arrived in Collingwood the sun came out and we were able to sit outside the old Courthouse Café and enjoy a cup of coffee and some excellent cakes. We walked across the dunes to see the sea and both thought it reminded us a bit of the North Norfolk coast near Blakeney. Rested and refreshed we set of back over the mountain in search of our next lodging, the Ocean View Chalets at Marahau. 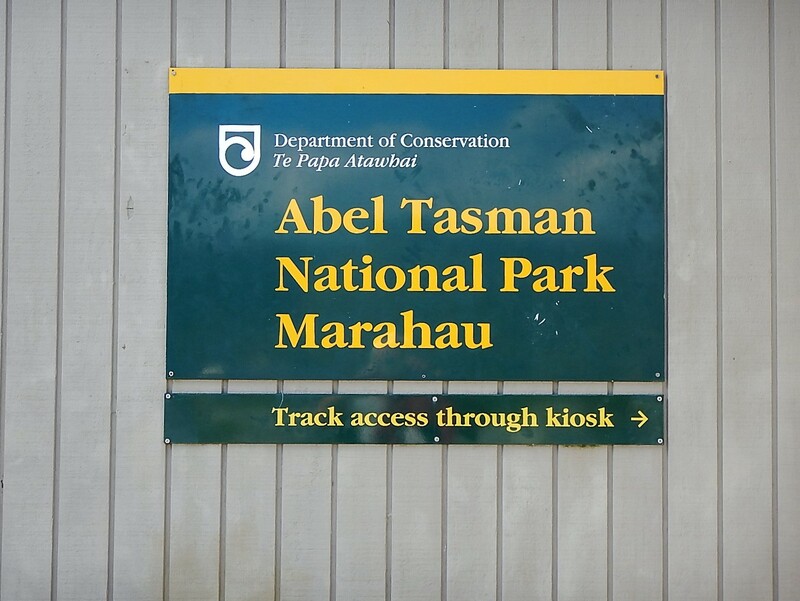 Marahau is the entry point for Abel Tasman National Park, the road stops there and if you want to go into the park you have to go on foot or take the water taxi which stops at various points along the Abel Tasman Track. The Ocean View Chalets were a cluster of maybe 10 wooden chalets built on the hillside about 100m from the end of the road. We drove passed them first to the visitors’ centre where we checked out the map of the park and had a sandwich and a drink at the little café. After that we checked in to our chalet and with great excitement took advantage of the guest laundry to get all our washing done – Hurrah. The chalet was really cosy and had a great view out over Marahau bay. It was also self-catering, we had stopped at a farm shop in Mapua and bought provisions so, as the sun went down I set about making chili con carne, the first meal I have cooked from scratch in nearly 4 months (pasta doesn’t count). We had a lovely evening watching the clouds gather again preparing for another stormy night. 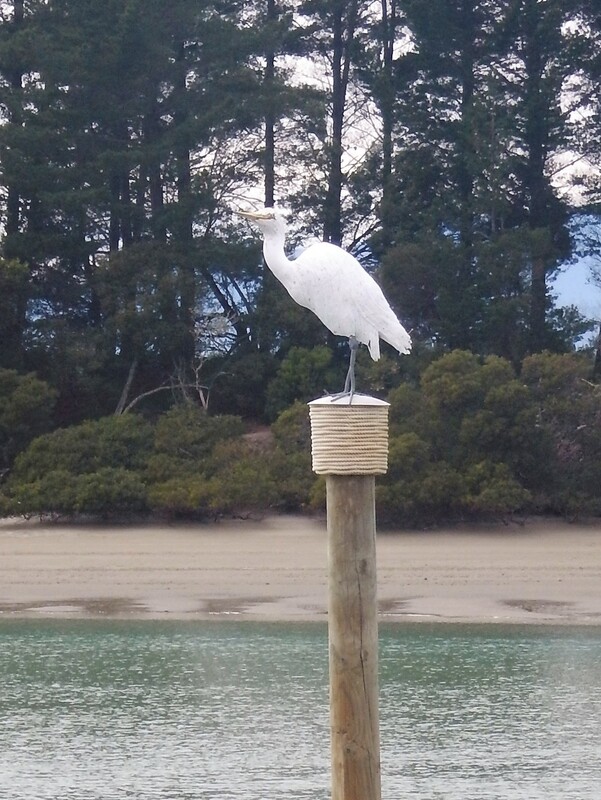 We had planned to do some walking in Abel Tasman but the water taxi was really expensive and neither of us fancied getting soaked in one of the heavy showers that kept starting so we abandoned that plan and stayed ‘at home’. When the weather did improve, we walked into Marahau to the one café/shop, had coffee and bought the makings of a toasted cheese sandwich for lunch. We spent some time in the afternoon exploring route options for our next drive to Kaikoura, the recommended routes both meant retracing our steps to Nelson and Picton which we didn’t really want to do. Mark had spotted a possible alternative, driving south and picking up Highway 63 across to Blenheim, we wanted to make sure there weren’t any unexpected mountain passes so we cross referenced all the maps we could find – oh how we miss the Ordnance Survey! We still had enough chili left for an evening meal so once again we raided the DVD library in reception and had another night in.